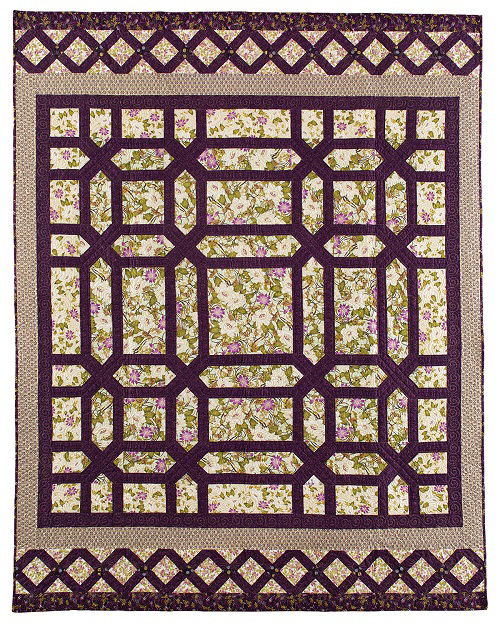 Kelly and guest Kate Colleran were both drawn to the same elements of Twilight in the Garden by Joanie Horton and Melanie Greseth of Tailormade by Design, but their remixed quilts turned out vastly different. Kelly used Liberty of London lawn print fabrics in an open interlocking design. Kate used darker colors than Kelly did, from Ink & Arrow Fabrics’ Pixie Dots collection. She also added a French braid border into her design.